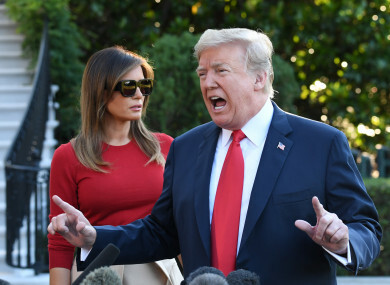 President Donald Trump talks to the press with first lady Melania Trump as he makes his way on the South Lawn towards Marine One to depart for Europe. DONALD TRUMP IS expected to harangue European allies for not spending enough on their defence today as NATO begins its most difficult summit in years. Trump set the tone for the two-day meeting as he touched down in Brussels, tweeting a demand that NATO allies “reimburse” the United States for defence costs. His stance earned him a summit eve rebuke by EU President Donald Tusk who said that Trump should “appreciate” his allies and that the United States didn’t have many. Trump said before leaving Washington that his meeting in Helsinki with Russian President Vladimir Putin next Monday “may be the easiest” part of his European tour, which also includes a trip to Britain, where the government is in crisis over Brexit. And he vowed not to be “taken advantage” of by the European Union, which he accuses of freeloading by relying on the United States for its defence while restricting US imports into the bloc, the world’s biggest market. “The European Union makes it impossible for our farmers and workers and companies to do business in Europe (US has a $151 Billion trade deficit), and then they want us to happily defend them through NATO, and nicely pay for it. Just doesn’t work!” he tweeted as he arrived in Brussels. European officials have expressed hopes that NATO members can paper over their differences but Tusk’s salvo exposed the deep transatlantic divisions. “Dear America, appreciate your allies, after all you don’t have that many,” Tusk said, before reminding Trump that European troops had come to America’s aid following the September 11, 2001 attacks on the United States. European diplomats fear a repeat of the G7, when Trump clashed with his Western allies, withdrawing from a joint statement and calling Canadian Prime Minister Justin Trudeau “dishonest and weak” before meeting North Korean dictator Kim Jong Un at a summit afterwards and praising him as “very talented”. According to a joint declaration prepared in advance of the summit, part of which was seen by AFP, NATO members will make an “unwavering commitment to all aspects of the defence investment pledge agreed at the 2014 Wales Summit” which includes the two percent target. But in a bid to appease the US president, they also vow to “submit credible national plans on its implementation”. However new figures published Tuesday will do little to satisfy Trump’s demands — they show that only seven European NATO countries will reach the two percent target in 2018. Crucially, they do not include Germany, Europe’s biggest economy and prime target for Trump’s invective, which is on course to spend just 1.24 percent of GDP on defence in 2018. US ambassador to NATO Kay Bailey Hutchison told reporters that Trump would also recommit to one of the founding articles of NATO – Article 5 — which holds that an attack on one member is an attack on them all. Email “NATO braces for bruising summit with Trump as he vows that US won't be bullied”. Feedback on “NATO braces for bruising summit with Trump as he vows that US won't be bullied”.